This is a tattoo made by Kendra Saulan at Painted Ladiez, Washington, USA. It reads ‘Fear not, for I am with you, Be not dismayed, for I am your God.’ Under the beautiful quote a dog flower is inked, this flower grew off the wood that Christ was crucified on. 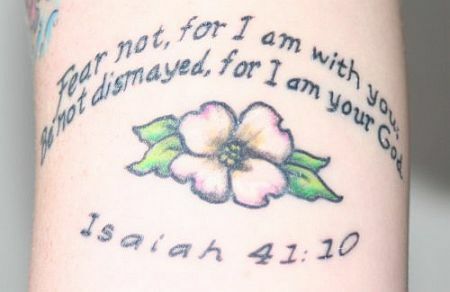 This tattoo refers to Isaiah 41:10 which is written below the flower.